In the meantime, this week we're shipping our first offering from the legendary Ed Gorman, a double volume of what the man himself considers to be two of his very best books. 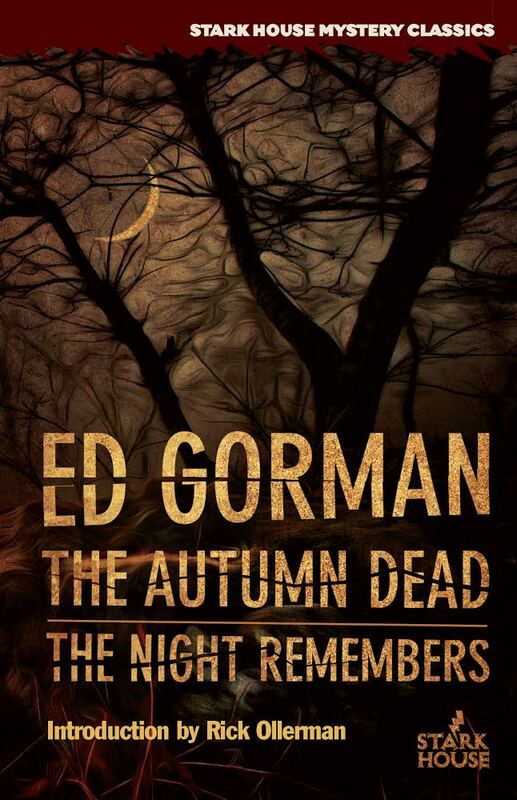 If you've never read an Ed Gorman novel before, here you'll find many of the trademarks of this long-time master: hard-bitten and lonely men driven to do what they have to do, a touch of nostalgia, strong characterization, and mystery, all adding up to compelling human drama. Booklist's review of the new Stark House volume says "Gorman has honed his craft through the years, but he's been very good for a long time." Holding has been hailed by such wide-ranging tastes as that of Raymond Chandler, Sarah Weinman and Christopher Morley. Her novels have been filmed, her stories collected into year’s best anthologies. Here we present two more of her superlative suspense classics, the first one a story of murder at a Caribbean resort hotel, the second the story of an aging alcoholic who is called in to solve a murder that hasn’t happened yet. New introduction by Ed Gorman. Due January/February 2015. Two novels that probe the political corruption of a big Midwestern city, where the important deals are always made behind closed doors, and the real power is wielded behind the throne. Burnett, one of the most important crime writers of the 20th century, is the author of High Sierra, Little Caesar and The Asphalt Jungle. Includes a new introduction by Rick Ollerman. Due March 2015. And from one of H. P. Lovecraft's favorite authors, we have another non-crime offering from Algernon Blackwood. This one contains many that have not been reprinted so if you're a fan, this one is a treat. Blackwood biographer Mike Ashley has created a new collection of stories and essays by the master supernaturalist, most of which have never been in book format before. Also included is a definitive bibliography of Blackwood’s writings as well as a new introduction by Ashley. A publishing event for classic horror fans! Due April 2015. So, until next time, keep reading, and if you have any questions about the subscribing or unsubscribing to the newsletter, or orders for books, just drop us a line here. And keep a look out for our major announcement. We won't keep you waiting long.